Guitars with optical pickups? Bowed guitars? Weird body-less “frame” electro-acoustics with MIDI? Effects you control with your finger? Why, sure. Read on. Inventor Ron Hoag will be showing his Optical Guitars (shown at right). If you’re picturing some alien instrument with Theremin-like pickups (something like this, perhaps), think again. The creator says the optical pickups work like ordinary pickups, only better, with “more audio range than other pickups and more responsive to the touch.” Judging by the MP3s on the site, it sounds . . . like a guitar. Should be a good sign. Bowed Guitar: Now, bowed guitar in itself is nothing new; I’ve even scored music for bowed guitar. But it is tricky to do on a conventional instrument. Enter the DRAMM Botar. (via the excellent AudioMastermind blog) The design concept is great: bend the fingerboard and reshape the body so there’s room for the bow. 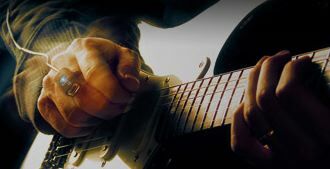 (The biggest challenge bowing an ordinary electric guitar is usually just accommodating the bow itself, in my experience) There are modifications to the pickups and strings, too, though I’m not clear on that bit. Sadly, no audio files, but maybe I can find this at NAMM. 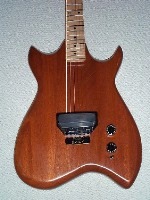 I Ain’t Got No Body: Also via AudioMastermind is the body-less electro-acoustic Frame Guitar. Is it really “the successful synthesis of traditional craftsmanship and modern technology,” making it the “best sounding electro-acoustic guitar”? I really have no idea. But it looks cool, in that sort of Electric Violin sorta way. (Guitar building is not one of my specializations, so can anyone else out there explain why this design would make a difference?) One thing that’s worth noting on this frame guitar that I do understand: it’s MIDI and digital-ready, with individual string pickups and RMC connectors (low-noise as well as digital), and optional MIDI connectors and MIDI volume. Add this to my list of guitars that seem cooler than the supposedly one-of-a-kind Gibson Digital Guitar that also cost less.